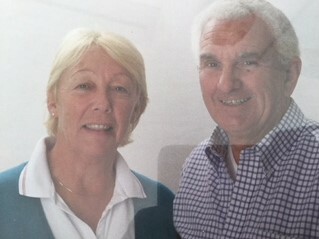 Pamela Morgan and Brian Harrold are the trustees of PING Charity and we thought we should put faces to the names. We are excited about this year’s project, working with The Girls Agenda we are going to build the Women’s Centre in Mansour, near Brikama. The land of 100mt by 100mt is bought already and we are finalising planning approval, and we really need your help to finance this project. Every little bit helps so please hit the donate button now. An area of almost 3 acres was cleared and 6 irrigation wells were hand dug to a depth of 8 to 10 metres. These would allow year round irrigation and depending on the vegetable/fruit allow 3 or 4 harvests a year. A substantial fence had to be erected to keep out villager’s animals and wild animals. Tools, seeds and training were also in the budget. This involved drilling a 6” borehole 80 metres deep. Solar panels were needed to pump the water from this depth to an elevated 20 mt3 Storage Tank from where gravity feeds it to a number of taps throughout the widely scattered village. This project ran concurrently with the garden work. We supplied Momodou with a laptop and digital camera getting almost daily emails and pictorial updates on progress. We visited Bafaluto in late November and were not disappointed. There was a great “buzz” about the village, clean water would be running before Tobaski (Dec 20th), the garden was being divided up to plots and each household would have its own area to begin cultivating in January 2008. Project completed within budget and on schedule. We have the two brick machines on site now at Njongon,all the way from the southern tip of India. The villagers have spent weeks gathering oyster shells which they fired in open fires to reduce them to lime. They have bagged 150 bags of lime which will be used with the earth and 15% cement to make the bricks in the manual hydraulic presses. They are then dried in the sun and will be used to repair their own homes first and then sold to surrounding villages. The bricks will be made here for future water tanks.Training has started on site from a local company who have been using the same brick machines for a year already. comprehensive sexuality education, and entrepreneurship. please e mail us for a full report.